When the sun finally goes down, homeowners want to see that the garden they been investing considerable money and time to look wonderful. However, without proper lighting, our well-designed garden may become nearly invisible. We may not be able to see it beyond a few meters. During a garden development project, lighting is often an overlooked factor. Good lighting could also improve the overall security factor in our house. It is more likely for burglars to enter a poorly-lit garden, because they have many places where they can hide. Low-level spreadlights could be used, as well as bright overhead lighting. Before designing our garden, we should walk around the landscape to consider whether we do have proper lighting in the area. We should take account of all viewpoints and focal points. Focal points are things that may look important at specific viewpoints. It means that we should consider the most likely viewpoints that people would take when the see the garden and what focal points that look dominant. Focal points should be properly illuminated, not too dim or too bright. We should also use specific lighting elements that create backdrops for local points. It is also important to avoid using ugly light fixtures that reduce the overall look of the garden. We nmay also use spike or pole mounted spotlights. This could provide us with a rather subtle effect and it should be quite enough for people to navigate themselves through the garden during the night. Because garden with tall bushes could be a perfect hiding spot for burglars, we could set up movement sensors in some areas, which can be automatically activated after 10PM. However, these sensors shouldn’t be triggered by small nocturnal creatures or movements of the plants during a windy night. Concealed pole mounted lights can be used to create interesting lighting effects behind bushes or trees to create a dramatic condition during the night. We may also consider using adjustable lights. 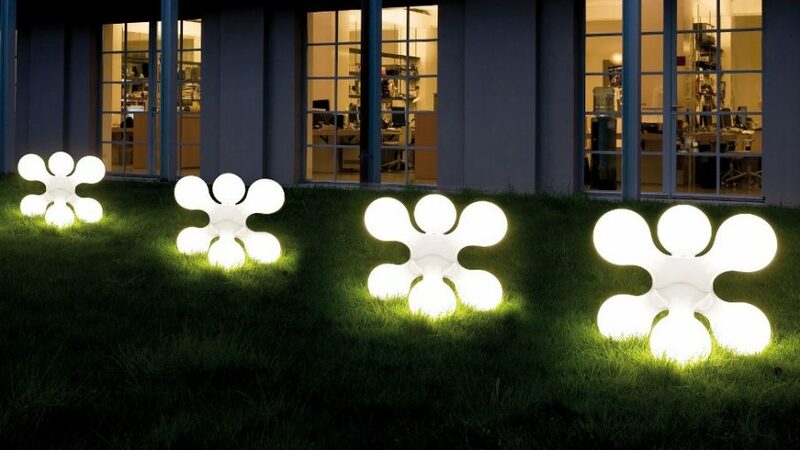 It means that we can uplight and downlight specific areas of the garden. We may draw to attention to specific colors of the garden. We could use crosslighting and emphasize textures. Pools of lights could also be used at the base of the posts. This will create a pleasant and gentle light during the night. If we want to use a single bright light, we should make sure that is spread evenly through the landscape. However, it is often easier to use multiple low-wattage spotlights that we can conceal behind the plants or bushes. Any decorative lighting elements should also have functional purposes, such as for actual lighting and security improvement. LED lighting is also commonly used these days. They are useful to deliver bright light source, despite the overall low wattage. Because lighting on the garden is turned on all night, we should calculate the total wattage needed. This will allow us to determine whether the lighting arrangement is efficient enough. We could also determine whether the existing electrical infrastructure is adequate.